For most of September I was under house arrest in order to write my masters essay, but when Tourism Victoria invited me as part of their Bellarine Taste Trail to join a group of journalists and bloggers at a dinner at Loam (a much-feted restaurant I'd been keen all year to visit), it was an offer too good to refuse. Many thanks upfront to Tourism Victoria for the dinner and for putting me up at the Vue Grand in Queenscliff. Loam is located in an olive grove down an unmade road buried in the Bellarine Peninsula, a short drive from St Leonards, Portarlington and Queenscliff. Owners Aaron and Astrid Turner run kitchen and front of house respectively. 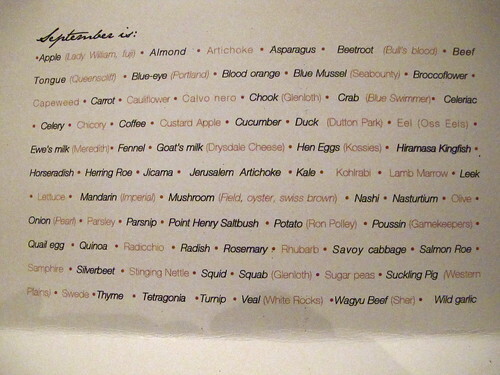 Rather than listing available dishes, the dinner menu suggests four, seven or nine courses ($60/$95/$120, or $100/$160/$200 with matched wines) and then alphabetically lists all the ingredients that are in season that month (the ones written in black are the ones in the kitchen that day). Let your waiter know if you'd prefer not to have any particular ingredients (one person at our table said he'd rather not have beef tongue), and then sit back and await your mystery dishes. At the end of your meal you get a printed menu giving some detail about what you ate. 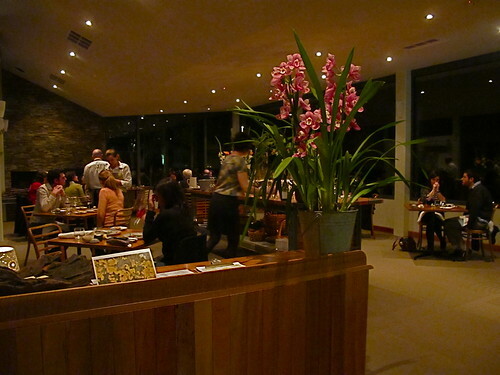 The dining room is spacious and unfussy, with huge windows designed to show off the olive grove vista (sadly invisible to me visiting at night but check out Emily's review on It Pleases Us for an idea of how it looks during the day). 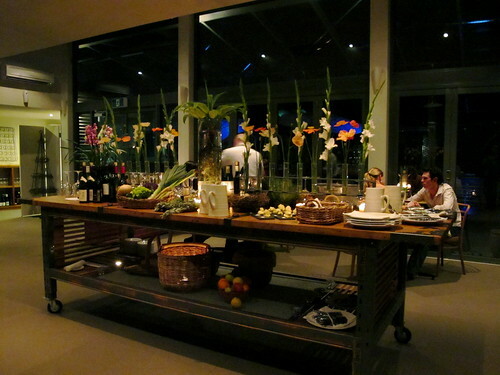 Splitting up the space is a large trolley table housing the glasses, the wines by the glass and lots of fresh produce. Storing the eggs in a nest was a cute touch. 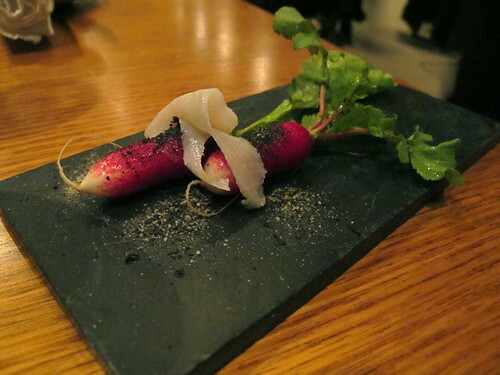 We had four courses, preceded by an amuse-bouche of a couple of baby radishes topped with nori salt and little strips of lardo, that most sinful of salume. We ate them with bread, salt and a fluffy, twice-whipped butter. 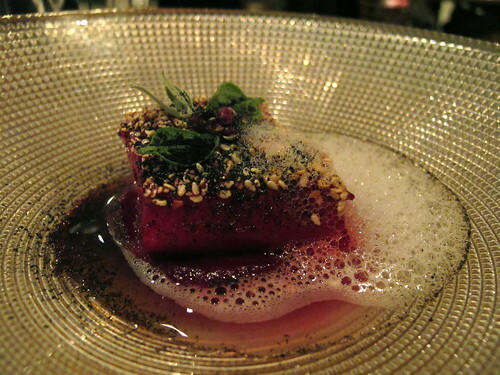 Next we were served a cube of hiramasa kingfish, stained a vivid pink by the bulls blood beetroot it was sous-vided with. 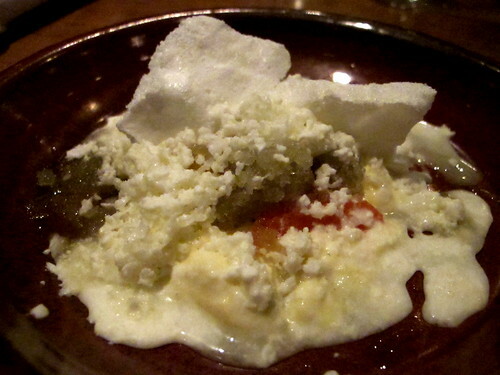 It was served with sesame, mussel foam and a sprinkling of foraged beach herbs (saltbush and tetragonia). Clean, punchy flavours matched nicely with a Beaujolais (2007 Domain des Nugues, Beaujolais-Villages). The next dish was probably my favourite: the wagyu tartare. The wagyu was Sher and it had been scraped over a dull knife rather than chopped (the preferred Scandanavian preparation method for steak tartare, according to our waitress - perhaps a legacy from Aaron's tour of duty at noma?). Underneath it was a generous smear of slow cooked egg yolk. I asked Aaron afterwards whether he'd done it 65/65, but he said it was a 60/67 egg (and of course now I can't remember whether it was cooked at 60 degrees for 67 minutes, or cooked for 60 minutes at 67 degrees... either way, it was bloody good). The white strips of squid prepared sous-vide gave the dish some textural depth and those little garlic flowers hit our tastebuds with a KAPOW! that belied their delicate appearance. I'm going through a real Gamay phase at the moment, and the 2009 from Sorrenberg is a gem with just enough spice to match the wagyu. Loved it. I was very taken with the shape of these Plumm wine glasses. The third dish was veal rump, sitting on a bed of (hidden) Jerusalem artichoke purée and sheathed in a translucent milk skin. 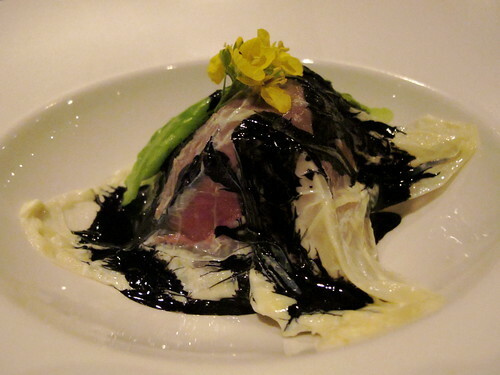 The spooky-looking milk skin was painted with squid ink and garnished with savoy cabbage and turnip flowers. Something of a signature ingredient at Loam (it has also been used with pink ling and with squab), the milk skin gave the dish a silky, slippery texture that I loved. The dish was served with a local wine, the 2008 Paradise IV 'The Bates' Ford' Shiraz. 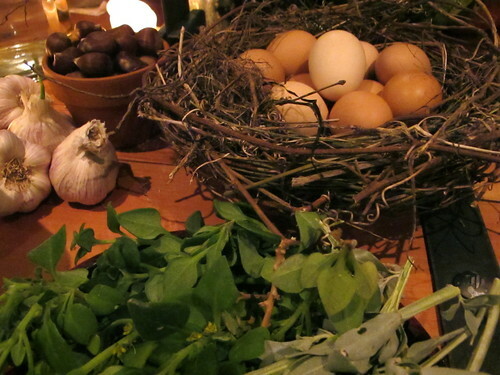 The dessert was something very different, a sort of deconstructed herb garden. It was composed of a loose rosemary panna cotta, thyme granita, ewe's milk granita, blood orange and a few fragments of meringue with a startlingly sharp accent of white vinegar. This was the one dish that didn't do it for me - the acidic meringue reminded me of the one Josh Emett did with dried passionfruit powder in his Eton messy dessert at Taste of Melbourne but in this case the meringue was astringent to the point where I felt it overpowered the other ingredients, and I didn't like the melty ice/milk combination of the granita. Like Emily, I'd been hoping to try the dessert with hay ice cream (the flavour all the cool kids are using). Guess I'll just have to revisit! 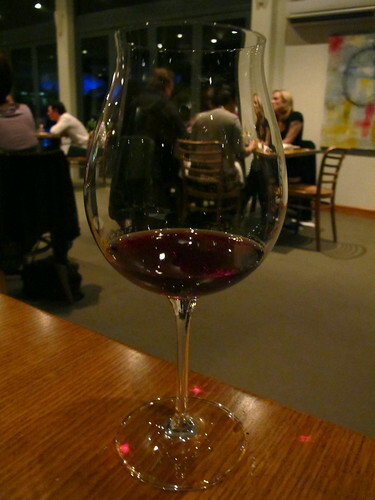 I did love the dessert wine though: the 2008 Foxey's Hangout Late Harvest Pinot Gris. 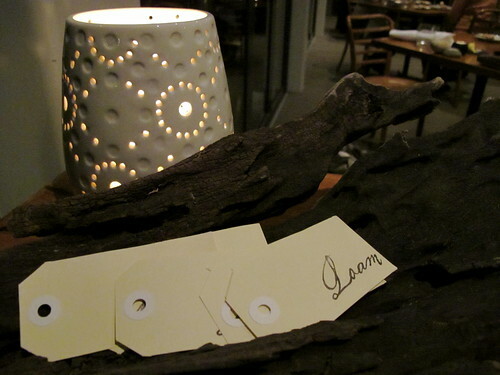 Despite not loving the dessert, I really enjoyed our meal at Loam: the food was intensely produce-driven but at the same time playful and experimental. 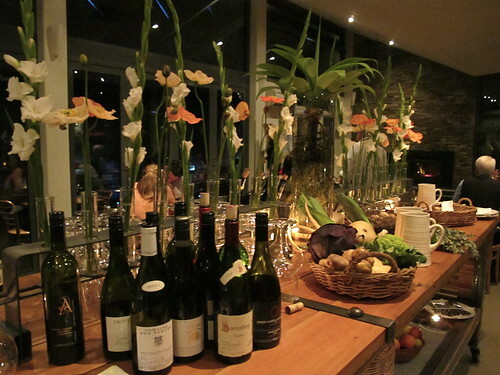 The staff team working with Astrid were highly professional, knowledgeable about the food and wine, and friendly. In a way I think it's almost a shame that Loam, in its first year, was so successful in the recent awards season - although of course massive kudos to Aaron, Astrid and their team for being awarded two Good Food Guide hats, winning Best New Country Restaurant AND Dish of the Year, and being judged Gourmet Traveller's #30 best restaurant in Australia - I only say that because now they may feel they have to provide the Two Hat Experience to expectant punters every time, when the kitchen clearly wants to play with dishes that are a little out there. Unlike somewhere like Attica which can run experimental Tuesdays, I imagine that Loam's rural location and mostly weekend clientele could make experimentation a bit more of a challenge. But I think it's fantastic that there's such interesting food down on the Bellarine Peninsula and I look forward to revisiting, maybe at the end of summer when the menu ingredients are completely different - and during the day so I can see that gorgeous view. Your meal looks pretty impressive. We had milk skin when we visited too, which is pretty interesting texturally. Queenscliff is one of my favourite places. 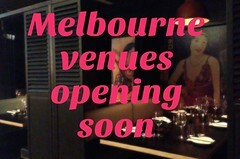 Any restaurant should continue to forge it's own identity as opposed to reacting or prioritising awards. As a chef owner in London said to me, "Awards and Michelin stars are a consequence of what we do. 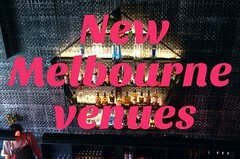 The staff love it on the CV but the real measure is seeing customers return time and again with a smile on their face." How beautiful everything looks. I best start saving for a visit! And given the ingredients list changes, I guess one never knows what one will get which increases the excitement factor (in my eyes, at least). Lucky you. 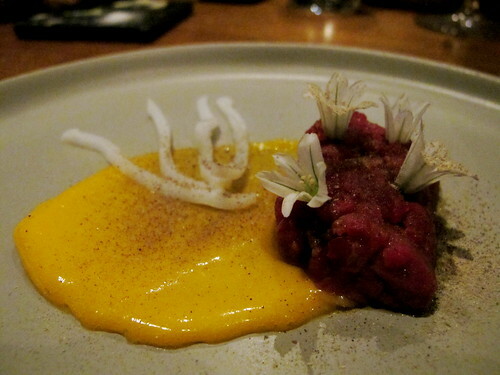 It looks gorgeous, especially the tartare, edible flowers! Wow. Thanks for another hunger-inducing post. I had the burnt hay flavoured parfait for dessert here a couple of months ago; im not a dessert person but this was incredible, ended up enjoying above all the other courses! that never happens for me so its saying something.